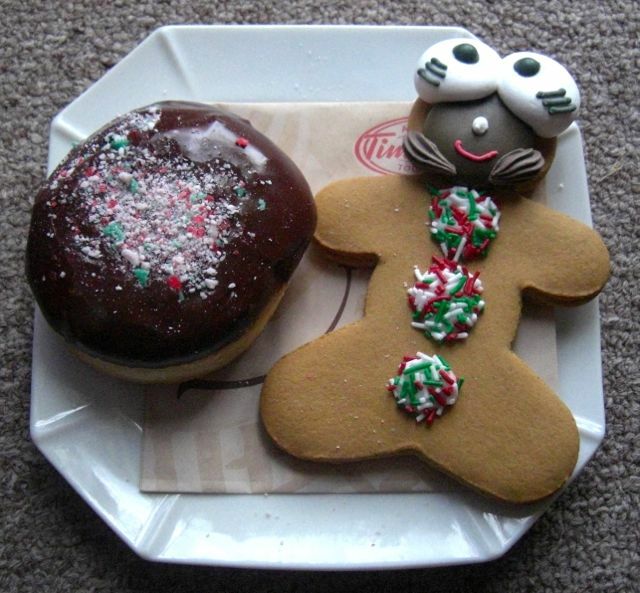 I have a thing for the gingerbread men from Tim Hortons. The cookie has a great flavour and the icing faces are made of my favourite kind of icing. It is crunchy and sweet and I always save the face for last. Mmmm... Timmies might serve these year round (but with less holiday colours) but I only remember them in December. Luckily I manage to eat more than enough around Christmas to last me the whole year through. At the drive thru the other day, John made me call over from the passenger side to order my treat, as he said "gingerbread man" is way cuter when I say it. Probably true. He got his standard, Boston Cream, but with a little holiday cheer on top. Oh my gosh, look at those eyes. Too funny. They are so much fun.